You may have heard that there are too many professional bloggers are using CDN to make their site to load faster, but for your blogger site, you need to have your own domain like www.yoursite.com. As it uses DNS of your site, so then only you can use CDN service for your blogger blog. You can check your current DNS on http://www.hypestat.com/. If you don’t have, then you need to purchase URL domain name for your blog or in addition, if you want web hosting as per your requirement get it from top dedicated web hosting companies listed as HostGator, BlueHost, GoDaddy and so on. So here I am assuming that you have your own domain name and you are aware of DNS settings. dd your website and click on 'Scan DNS Records'. This will take 60sec. to scan DNS records. Next window will show the DNS Records for yoursite.com. Here you need to check and verify all DNS settings & nameservers are same as per your domain provider, if not, then you can easily add here A, AAAA, and CNAME records. Then click on Continue. Select a CloudFlare Plan as a FREE WEBSITE. 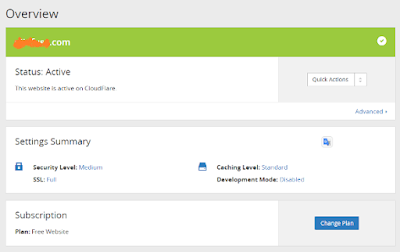 If you want you may go with Pro, Business or Enterprise Website plan to get more advanced features of CDN. Click on Continue. 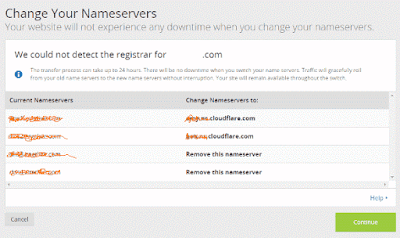 In next window, you need to change your nameservers on your domain name provider site. 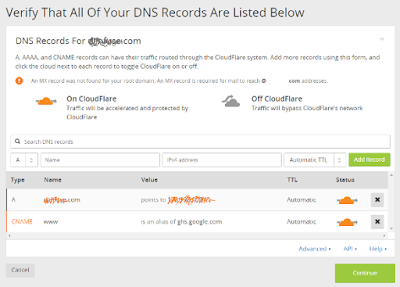 Copy nameservers from CloudFlare and paste as they suggested on your domain provider website. This process can take up to 24 hours to fully functional. Note that, your website will not experience any downtime when you change your nameservers. After that click on continue. 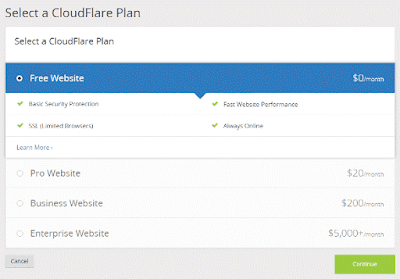 Now you will get the status of your site getting added into CloudFlare. It requires 24hours to be processed. Your site will remain available throughout the switch.